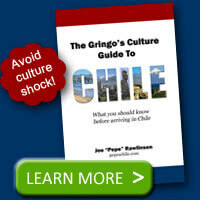 Chilean pancakes are a tasty treat that are served at breakfast, at once (Chile’s evening snack or dinner), or dessert. Chilean pancakes, or panqueques as they are called locally, can be quite sweet and help satisfy the sweet tooth that most Chileans have. They are one of my favorite traditional Chilean foods. 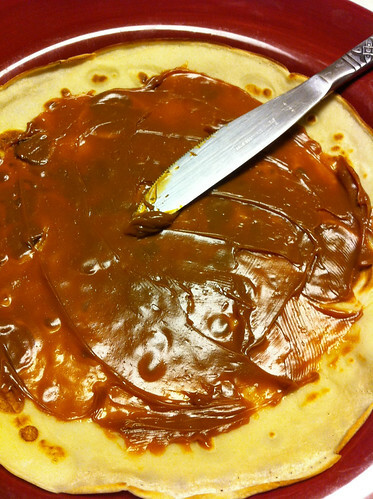 Simply put, the Chilean pancake is a crepe, covered in manjar (a very sweet carmel-like spread). Whisk the flour and eggs together in a mixing bowl. Slowly add in the milk and water while stirring. Add the salt and butter and whisk until smooth. 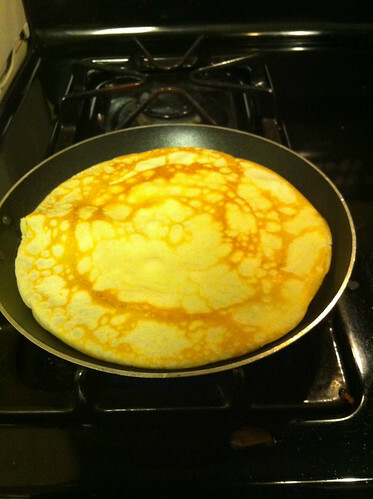 Ideally you’ll have a small circular crepe pan. If not, use a non-stick frying pan or griddle on medium-high heat. Pour about a 1/4 cup of batter into the pan for each pancake. Tilt the pan in a circular motion so the batter coats the surface evenly. Cook the pancake for about 2 minutes or until the bottom is light brown. The edges should start to lift up and off the pan. Loosen with a spatula, flip over and cook the other side. Remove cooked pancake and let cool on rack. When cool to the touch, spread a thin layer of manjar on one side of the pancake. 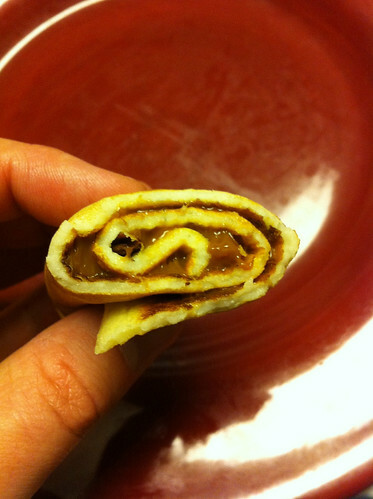 Roll the manjar-covered pancake inward so that the manjar side folds in on itself. Serve with ice cream, powdered sugar, or as is. You can serve the Chilean pancakes chilled or fresh right after you make them. 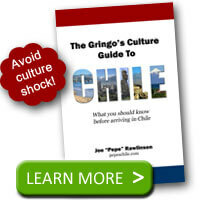 If you like Chilean pancakes, you should try some other Chilean desserts from the comprehensive Chilean cookbook Tasting Chile: A Celebration of Authentic Chilean Foods and Wines. this are so good!! I’m an exchange student in America from Chile and my Host family really enjoy reading all this information about Chile (awesome country). @Berni – I’m glad your host family has enjoyed reading the site. Hopefully they enjoy the panqueques too! Made these tonight, along with the homemade manjar. Loved!! @Vicky – that’s great! You’re making me hungry. 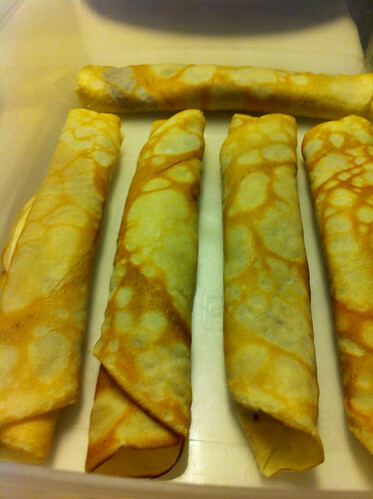 If you stack them- pancake,manjar , pancake, manjar and so on, you make torra de panqueques. Once the stack is high enough , slice in to wedges and dust with powdered sugar. Delicious.